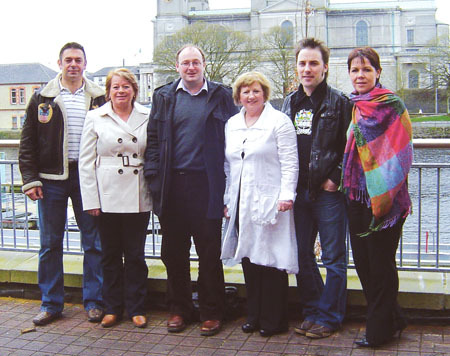 Ollie Berry, Angie Bannon, Cormac Lally (Midlands Simon Community), Kay Rigney, Colin Fahy, and Irene Keenan. The concert in aid of the Midlands Simon Community, to take place in the Radisson SAS on Friday April 3, really does have a treat in store for everyone. The quality of the performers speaks for itself and, at €15, represents exceptional value for money! This superb concert will begin at 8.30pm, with doors opening at 7.30pm, and will be fully seated in cabaret style, which will allow all those lucky enough to be there to either dance away the recession blues or to simply relax and enjoy the show from their table. The list of those who are travelling from near and far to perform on the night confirms the quality of entertainment; Mystery Train (from Soul to Rock`n`Roll ), Mary Lee Jones (the Voice of Shirley Bassey and winner of TG4’s Search for a Christmas No 1 ), Thukolo (Kilkenny’s inspirational 20-piece Gospel choir ), Ciaran Houlihan (winner of All-Ireland Elvis 2008 ), and Tommy Lee Jones (the sensational Tom Jones tribute ). Special guests include local singer/songwriter Colin Fahy and renowned singer and musician Angie Bannon. Special guest MC for the night is Shannonside Radio’s finest, Pete Casey. Kay Rigney, chairperson Westmeath Friends of Simon, said “This gives people an opportunity to see some truly great performers in an excellent location, and at the same time know they are helping Midlands Simon Community to support those in our community who need it most”. Midlands Simon Community supports people who are either at risk of, or who are experiencing homelessness and has worked with over 500 people to date. Tickets, at €15, are on sale now from Music World in Athlone, from the Simon Shop at Sean Costello Street in Athlone, or by phoning (087 ) 9925083.